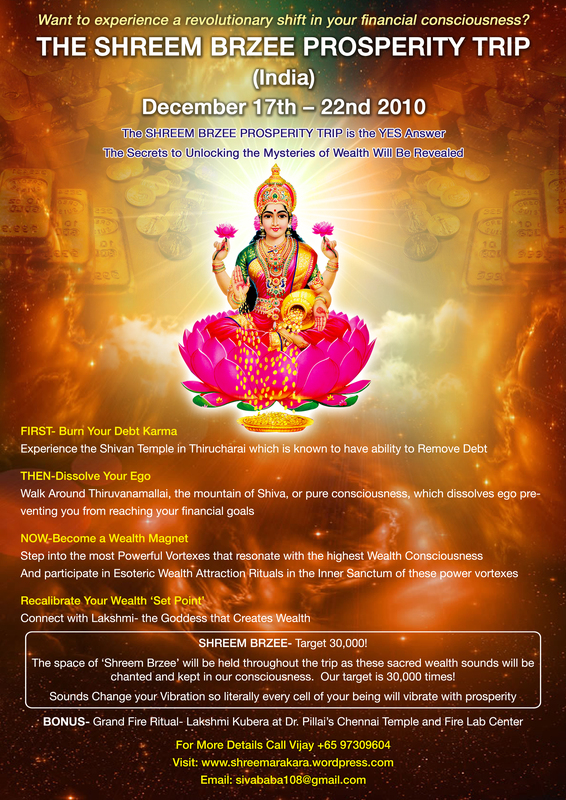 Dr Pillai (Baba)’s ashram in India did a divine job designing the flyer for the upcoming SHREEM BRZEE Prosperity Trip in December 2010 and I would love to share it with you. Thank yous to Lalita, Kaarthick and Ramu! Please share news of the SHREEM BRZEE Trip with everyone and help usher in a new prosperity consciousness revolution ! Wish to know more about travel, places / temples covered in the package etc. etc. Please subscribe to our ShreemArakara blog (just click on the button at the right side of this page) to be kept updated for future trips.